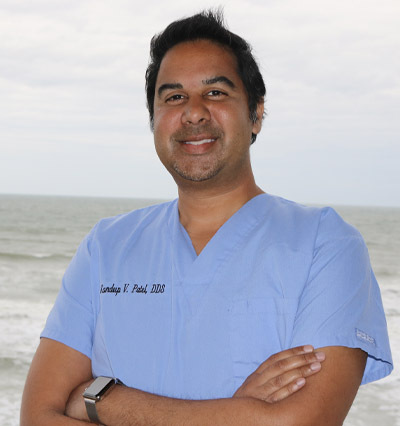 Dr. Sandeep V. Patel was born and raised here in Daytona Beach, Florida. Dr. Patel received his undergraduate degree from the “U” – University of Miami. After graduating from Miami, he moved to New York and earned his Doctorate of Dental Surgery Degree from New York University in 2009. He continued his education in a General Practice Residency at Albert Einstein College of Medicine’s Jacobi Medical Center where he earned the highest possible resident evaluation score. While in New York, he also completed advanced implant dentistry training under world renown dental implantologists. After braving one last cold winter in NYC, Dr. Patel left a practice in Manhattan’s Upper West Side to return home to Daytona Beach where his father, brother (both local Nephrologists) and mother reside. He is married to Dr. Sapna Adappa, who is also a dentist in Ormond Beach and together they have twin boys. Dr. Patel is the past President of the Volusia-Flagler County Dental Association, and is currently on the board of the Daytona State College dental science advisory committee. He has been a featured guest on the the radio show “Your Health Matters”. Professionally, Dr. Patel was awarded the prestigious fellowship distinction by the Academy of General Dentistry. Locally, he has been named Best Dentist by Hometown News, and awarded as a Top Healthcare Provider by the Daytona Beach News Journal. He was named a Top 40 under 40 young professional of Volusia/Flagler and awarded the distinction of The Most Charitable Young Professional of the Year by the Daytona Beach News Journal.